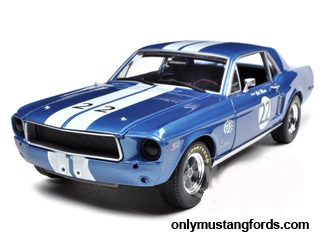 Part 2 - Mustang diecast car 1968-70 vintages. If your taste for the Ford Mustang runs to the later first generation pony cars, this is the place to find them. Part 1 includes models from 1964 1/2 to 1967. And there's just as many great choices in these later cars. For more details, including prices, just click the blue links. 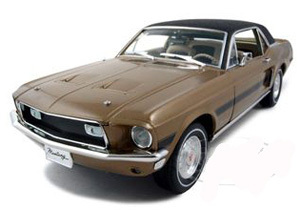 The 1968 Ford Mustang was for the most part, the last example of the classic first generation pony car styling. And this beautiful Red 1968 Mustang GT Fastback is a great example of how beautiful and powerful these early muscle cars really were. Your limited edition Mustang will be one of only 1,500 total cars made and looks great painted in Aqua. Check out the detail in this incredible 1/24 scale masterpiece. 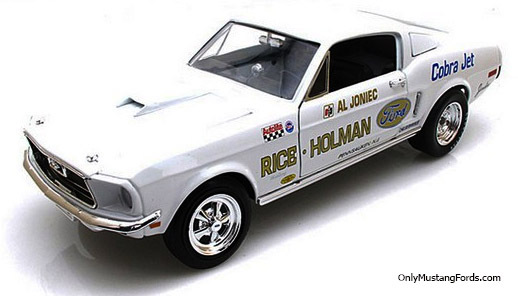 Can you imagine the 1968 Ford Mustang model year without a 1968 Al Joniecs Super Stock Eliminator . This larger 1/18 scale wonder is meticulously crafted and yours will be one of only 2,250 cars in the world. Here's another cool rendition of the classic 1968 Mustang High Country Special , complete with gold paint, black vinyl roof and matching black trim stripe. If you can't justify the gallons of premium fuel needed to keep a big block Ford Cobra Jet happy, you can still enjoy the beauty and awesome styling of your very own Jet Blue 1968 Mustang CJ . This cool Cobrajet is deep, blue and beautiful and it's available in 1/18 scale. 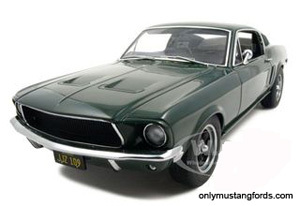 However if your favorite place to show the Ford Mustang of your dreams cries out for a more substantial offering, then this Hyland Green 1968 Mustang Bullitt diecast car is just the thing to fit the bill. At a solid 1/18 scale size, its finely crafted features are available for all to see and admire, including its authentic looking 390 cubic inch high performance V8 and even the requisite Black California plates. The Franklin Mint makes some very detailed and beautiful cars. 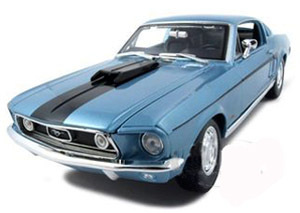 This 1/24 scale, 1968 Ford Mustang GT California Special is a great example. And yours will be one of only 2,500 produced. Here's a great example of what you don't see in the stores. It's a Bill Maier Racing Trans-Am Tribute Edition Diecast Car , a limited edition Mustang diecast car, with only 1,500 made worldwide. Need a big block? 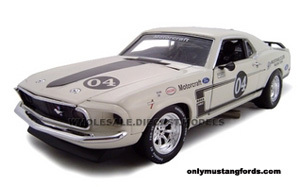 Here's an awesome diecast 1968 Mustang GT390 fastback. It's quick, red and fast in 1/18 scale! Here's another limited production car, a real piece of history ! It's a 1969 Mustang Boss 302. Smokey Yunick Trans-Am Tribute Car in 1/18 scale. Yours will be only 1 of 600 Made. The original was one of only 7 Boss 302's specially prepped for trans am racing for Smokey and included acid dipped bodies and engines prepared specially by the individual race teams. Here's another cool 1969 Ford Mustang Boss 302. It comes complete with the authentic flat black hood and Boss stripes and is also a 1/24 scale diecast model. Check out the competition decals and race glass. 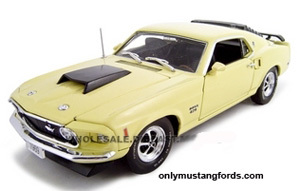 Check out this nice 1969 Boss 429 diecast Mustang. It's painted in Yellow, with great looking Magnum wheels and includes a highly detailed Deluxe interior. Looks great on your desk or showcase in 1/24 scale! 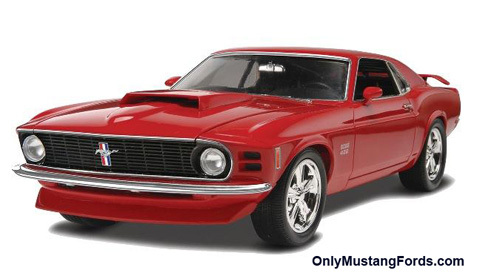 The 1970 model year could not be complete without the legendary 1970 Mustang Boss 429. This beautiful deep red diecast 1/24 scale model is ready for that special someone on your list. What's wilder than a Boss? Many experts believed the legendary Boss 302 was even better than the big block 429, due to it's lighter weight, better handling and extremely close performance. Can't decide? 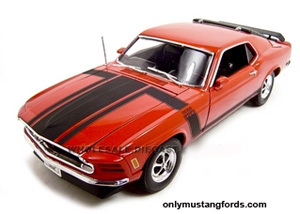 It's a 1/18 scale wonder of a model, with a detailed rear spoiler and fastback window louvers and finished in a glossy red paint with matching Boss 302 Stripe package. Hmmm... a birthday present and a Christmas present. That could work!